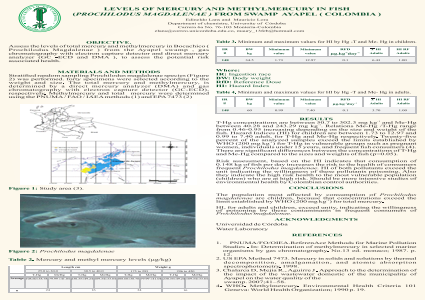 Author(s): Mauricio lora A, Edineldo Lans C.
Abstract: Determinig the levels of total mercury (T-Hg) and methylmercury (Me-Hg)in fish(prochilodus magdalenae) to establish the risk associated with their daily in take. Two samplings were carried out during the months August and Semptember 2014. 40 specimens depending of size and weight were selected and purchased to fishermen of region. The T-Hg was determinated with a direct mercury analizer (DMA) by thermal descomposition,amalgamation and atomic absortion TDA-AAS and Me-Hg by gas chromatography with electron capture detector (GC-ECD). The T-Hg concentrations are between 50.7 to 302.3 mg Kg-1 and Me-Hg between 40.28 to 243.29 mg Kg-1. The Me-Hg/T-Hg reasons range from 0.46 to 0.95 increasing this ratio based on the size and weight of the fish. The hazard index (HI) for children and adults are between 1.73 to 12.97 and 0.99 to 7.40 for T-Hg and Me-Hg respectively. The T-Hg concentrations of the analyzed samples did not exceed 500 mg kg-1 established by Colombian legislation in fish for human consumption. There are significant differences between the concentration of T-Hg and Me-Hg in relation to the size and weight of the fish ( P<0.05). HI indicates that consumption of 0.148 kg of fish per day in the people of the region could increase the risk and susceptibility of poisoning these pollutans. The results indicate a high risk for human population specially children who are most vulnerable. organisms by gas chromatography. No.13 ed. monaco; 1987. p.
Salamanca Grosso, G.; Osorio Tangafarife, M.P.